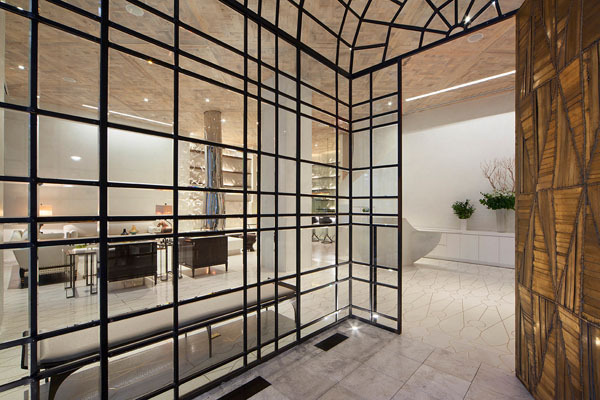 From the lobby’s hand-blown glass to the breathtaking vestibule assembled using 670 pieces of faceted steel, and the 14-foot fireplace, almost everything at Marmara Park Avenue has been custom-designed and individually produced by artisans in the five boroughs. Centrally located, yet conveniently discrete on lower Park Avenue, the new U.S. flagship of the storied Marmara Collection hotel group, Marmara Park Avenue tapped acclaimed New York artist/designer Joe Ginsberg to create an environment where guests would feel they’re coming home to a chic but cozy pied-a-terre. After a meticulous adaptive-reuse of its beautiful 1927 building, the hotel recently opened in January 2016. With his own living space in mind, Ginsberg tapped a circle of New York artisans to furnish Marmara Park Avenue’s guest rooms and public areas with his designs. Those bespoke items are complemented by hand-picked objects from design-forward purveyors. Nothing has been sourced from typical hotel-industry suppliers. The stunning result is a hotel that radiates understated Manhattan glamour, but with artisan fingerprints – a true “Made in New York” experience. Travelers who’ve spied just-so city apartments in magazines or real-estate ads will recognize the warm residential ambience. The smart atmosphere is enhanced by impeccable service combining European gentility with discreet New York efficiency. Sleek amenities include iPad Airs in every room, connected to a 24/7 virtual concierge. Along with traditional guestrooms, spacious accommodations include apartment-style configurations with fully equipped kitchens ideal for extended stay travelers. Marmara Park Avenue’s grand three bedroom duplex will make guests feel like they want to move in. Hardwood floors and stainless-steel Fisher & Paykel appliances in many rooms make suites feel like cool, easy urban lofts. Views from Marmara Park Avenue are classic New York, with 40 rooms offering private terraces – a prized amenity in Manhattan. They’re a perch over an iconic urban landscape of fire escapes, water towers, and faded brick façades. Steps away from The Empire State Building, all 128 accommodations with a mix of suites, guestrooms and three penthouse suites boast soaring ceilings that capitalize on the location’s natural light. Casement windows offer uninterrupted and unparalleled views of the New York skyline. The hotel boasts 1375 square feet of private event space which can be divided into two rooms or rented as one spacious venue. Within a beautifully appointed room, the event space is hardwired exclusively with state-of-the-art-technology in the context of a classic environment and will make a well-appointed alternative to conventional meeting spaces. Beneath the lobby, Marmara Park Avenue’s Wellness Center will offer a haven from Manhattan hustle: Guests will enjoy a breathtaking lap pool, a cleansing steam bath designed to help guests unwind, relax, and recharge and of course a comprehensive fitness center. Access to the wellness center will be exclusive to hotel guests and included within the room rates. On a quiet corner in the white-hot Midtown South neighborhood, Marmara Park Avenue situates guests a heartbeat away from the pulse of New York City. Visitors will find that Manhattan’s most storied attractions are closer than they could have imagined. From the Empire State Building to the legendary boutiques of Fifth Avenue to the serenity of Madison Square Park, Marmara Park Avenue delivers the best of Manhattan. Guests can discover an unparalleled range of restaurants and bars mere steps away from the comfort of their rooms. Conveniently located near Grand Central Station and boasting more than 8 train lines in the immediate vicinity of the hotel, Marmara Park Avenue makes every corner of New York City accessible. Rates at the Marmara Park Avenue will begin at $500.